I think I have finally found the closest recipe to my mom’s dressing. Either way, I am pleased beyond words on this Thanksgiving night. I have my mom’s recipe via phone from a few years ago, but I really do not have the recipe – just bits and pieces. Things you just listen to and sort of write down. But not really. This is a recurring theme for me. I know, there are just so many questions that I have unanswered. It is frustrating – very. Well, at least this year I feel I have made progress and that is something. So here is the 2016 version of dressing. And it was really amazing. There were no left overs after of a couple of days – that should tell you something. Preheat oven to 250 degrees and toast cornbread for an hour rotating half way through. Increase oven to 350 degrees. Spray a 9 x 13 inch baking dish with cooking spray. In a 12 inch skillet, saute onions and celery until soft, but do not let them brown. Add some water now and then, like my mom did, to steam the vegetables. These smells are Thanksgiving to me and that is what you need to wake up to on Thanksgiving day. In a really big bowl, mix together vegetables, cornbread, rosemary, thyme, 2 cups of broth and 2 Tbs melted butter. Season with salt and pepper. Important fact – taste this now and adjust seasonings. Then add eggs. My mom’s paranoid ideas about raw eggs. Spoon into prepared dish. Top with the last Tbs of butter. Bake until lightly browned, about 40 minutes or so. * Baseball-sized yellow onion, I hate when a recipe does not give a size. It is annoying. ** Peeled, we, and by that I mean you, do not want strings on you celery. No you do not. At all. I do realize that I have (probably – mostly) posted about this before. It is one of those not-recipe recipes. This is a mix of my mom’s baked beans and my former mother-in-law’s baked beans. But it really is something special. I am glad to be the one who mixed these two recipes together. And I am really glad that that had a great mom and one of the best mother-in-laws. And for many years I have had another mother-in-law that I love like a mom. It is kind of stupid, but also ironic, that I use Bush’s* vegetarian beans but top them lots and lots (and lots) of bacon. I do kind of like that the vegetarian beans are kind of neutral so I get to flavor them the the way I want. That means lots of brown sugar, mustard (yellow = more vinegar), yellow onion, Worcestershire sauce, and baking it slow and easy. That is how baked beans work. This is not something you can rush at all. Nope. When the Boy and I had a Wednesday Night Cooking Class about this, the most important thing I could tell him about this is test the flavors before you put this in the oven. Figure out the balance – do you need more of something to balance this out. Because if you cannot figure that out before putting it in the oven, you will not be happy. Baking only concentrates the flavors. But when you top the whole thing with lots of bacon, that somehow fixes everything. Baked Beans – not a recipe at all. This is not a recipe. Consider it a guide line of sorts because that’s really all it is. This is a comforting food to me. It reminds me of many things all at once. This started largely on my mom’s recipe, but modified into more of my former mother-in-law’s recipe. Loura used to serve it as part of Thanksgiving in her special bean pot. The bean pot was kind of a robin’s egg blue – really pretty. I had never knew anyone who made baked beans for Thanksgiving, but it totally works. I mean it. Really. 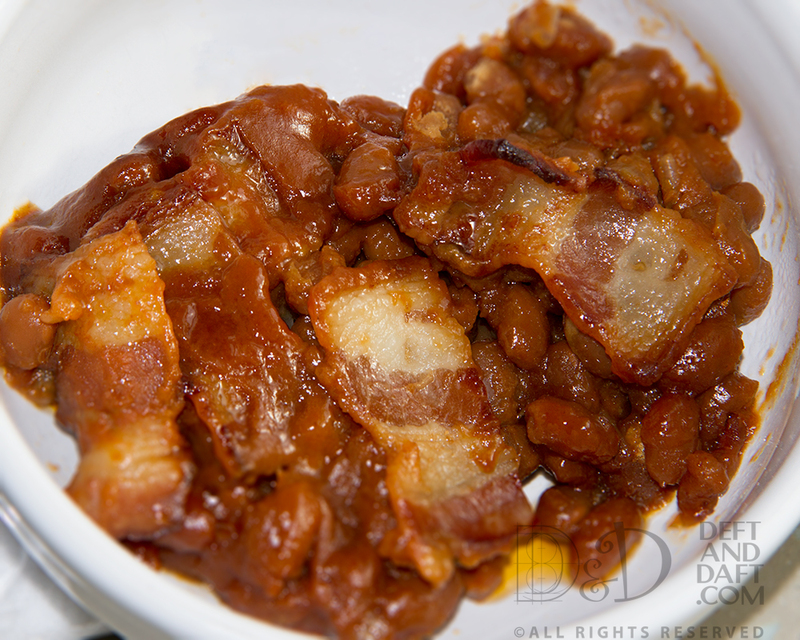 These beans are tangy, sweet, mustardy, oniony, and smokey with bacon. But for many years I did a vegetarian version and still do when I don’t happen to have bacon in the fridge. I buy Bush’s vegetarian baked beans to start because they are blank canvas-ish (they were on sale this week, buy one get one – yeah!) and then doctor it up with the favors I like best. Worcestershire sauce – required – well, pretty much everything here is required. It is. Mustard, yellow or Dijon – I prefer Dijon now, but either will do. Bacon – not necessary, but really good. Set oven to 350 degrees. Bake the mac n cheese first. Oh yeah these two things go together well. Anyway. That’s another recipe for another time. Another family recipe. In a baking dish – I use a blue ceramic baking dish from Portugal that’s about 10″ by 7″ that I purchased in a Stein Mart in Durham, NC, and one can of beans works perfectly. I just mix everything else in there, but not the bacon – that’s for the top – again not a recipe. Here’s the thing though – you really have to taste it after mixing the beans, Worcestershire, brown sugar, onion, and mustard together and decide if you like the flavor – is it well balanced? If you don’t like it then – well, you won’t like it any better when it’s become more intense after baking. So taste and adjust. It’s pretty important. I wish I could give you an exact recipe, but sometimes you just can’t and that means you’re just making food you love. Is there anything wrong with that? I think not. Thanks to Becky and Loura. Great inspirations. I know this was originally a Rachel Ray recipe (30 minute meals, I think), from at least ten years ago, probably more, but I’ve messed with it so much that it is not recognizable as such. This is what The Boy will inevitably request when I ask what he wants for dinner and for leftovers. He makes good use of leftovers after he gets home from work or from hanging out with his friends. I honestly have to hide some if I want leftovers for lunch myself. In a large skillet, heat a couple Tbs olive oil, add onion and sauté until it begins to soften. Add ground chuck and break up as the meat cooks until it is no longer pink and onions are soft. Add vinegar, seasoning, brown sugar, and Worcestershire sauce to beef. Season with salt to taste. Let this simmer for a few minutes and taste for balance. This is key and I still do it every time. It’s important to do that now before adding the tomato sauce because all those flavors intensify and if you like them now, you’ll like them better later. Then just let is simmer for about an half an hour. I tend to make this a day ahead, because like spaghetti sauce or chili, it’s so much better the next day. Some times I make cole slaw with this, sort of the BBQ/cole slaw sandwich thing going on and it really works. But I guess you have to be raised with the BBQ/cole slaw thing as part of your life to get it. 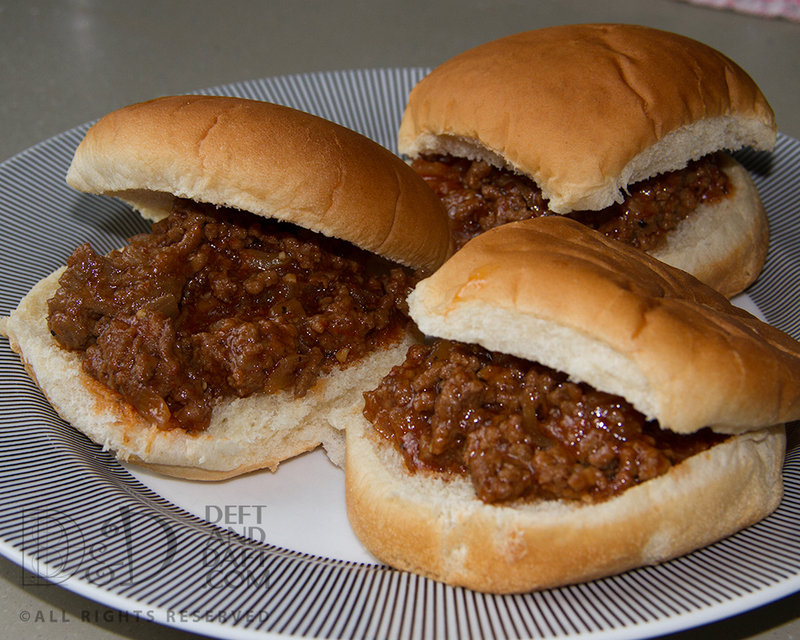 I was raised on Eastern NC (vinegar-based) BBQ because both my parents are from there. And every summer when we went to NC, we would come home with a cooler of Revels BBQ. Damn – that was amazing stuff and I still think about it – probably too often.